I’ll be starting this book in a couple days, once I’ve finished Robert Silverberg’s highly entertaining Ace Double The Silent Invaders. I peeked at the first chapter when I picked this book up on the same Portland trip that brought me Crashing Suns and it looks delightful. The cover depicts a scene from chapter one, when the immense god-thing orders his hordes of slaves to carry his palanquin across a deep ravine by throwing themselves to their deaths so that others may ferry the creature across over their crushed bodies. Then the sea pours in, and the big bad is preserved for a later day. The back cover makes The Atlantic Abomination sound more like a horror novel than a work of fantasy or science fiction, but the phrase “Godzilla, Gorgo, King Kong… stand aside for The Atlantic Abomination!” plus the giant size of the creature in question make me think I’ve got a giant monster story ahead of me, which sounds delicious. John Brunner’s The Traveler in Black was perhaps the best book I read last year, and Brunner (whom I had not previously read) has graduated to “buy on sight” status. This book will be my secondary test. 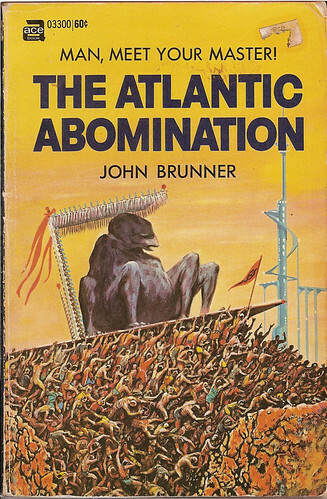 If I like it half as much as I liked The Traveler in Black, I suspect I’ll be reading John Brunner for years. If I had to guess, I’d say that 9/10 books that I’ve read was chosen because of the cover… its not a guarantee of quality though. if you like his lesser works than…..
DEFINITELY read ‘Stand on Zanzibar,’ ‘The Shockwave Rider,’ ‘The Sheep Look Up,’ and ‘The Jagged Orbit.’ These are his masterpieces. Eh, standard grade-B Ace Double stuff. The flip side might have been “The Martian Missile” by David Grinnell; not sure, don’t have my old copy handy at the moment. But “The Traveler in Black,” it ain’t. I should have checked back with a review after I read the book. According to Mike Moorcock, I think, John Brunner was embarrassed by this book and used to wince every time someone asked him to sign it. I didn’t think it was _that_ bad. It basically was a giant monster story, and a decent one at that, but I agree with your assessment. I’d probably give it a B- overall, with the Traveler in Black being a solid A, verging into A+ territory. I’ve not since read any Brunner, but when I do it’ll probably be Stand on Zanzibar, since everyone seems to love that one. Oh, and I should probably get back to this blog now that all of my paperbacks are unpacked and shelved after my recent move.